Barely any artwork going on around here lately. I always plan to but then there is work, wash, cook, grocery store. Always not in the mood for art at the end of the day, always tired. Not feeling so great about what I'm getting accomplished at all. Thank you for the compliments on the header rose painting! That was one of the first ones I did back a couple of years ago when I started back into art. Hoping to catch up with everyone else soon. 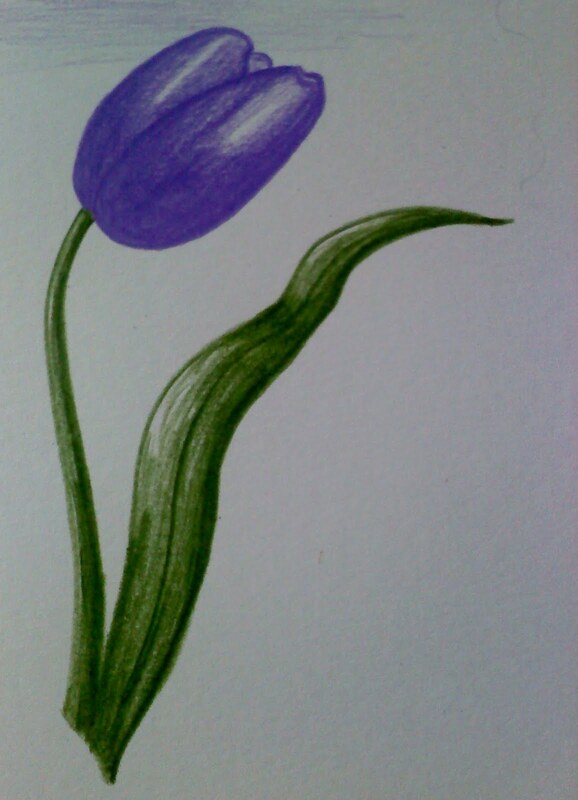 This quickly sketched tulip is in color pencils. Hope all is well, miss you all. Well that quickly done tulip is wonderful. Hope you get some time for Art making soon. Hi T! I know you have a busy life; we all do. There doesn't seem to be much space for things like art and fun stuff, is there? I love your "knocked out" tulip. Good job in short time. Not to worry. You will have plenty of time for art when your kids are out of the house. You still deserve some "me time" now though. Nice tulip. I think art must need immersion, and most of us have other things that must be tended to. Your work is lovely. Just continue on and don't let that spark cool. you really need to squeeze more art time in...it might help you to feel revived enough to tackle the less fun, more mundane aspects of life! like laundry and dusting! your tulip sketch is great! thanks for sharing this..i love anything floral! I can empathize. I'm trying to do my art in the morning while I'm fresh and unrushed. At the end of the day, like you, I'm tired... and not to inspired to do art!